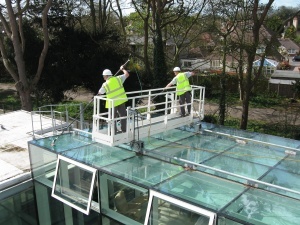 Before we commence any cleaning work we will visit your premises and carryout a thorough Risk Assessment and Method Statement in full compliance of the latest regulations. All our cleaning activities are fully covered by public liability insurance. In April 2005 the Working at Heights Regulation (WAHR) became Law. The regulations state that work should not be carried out from ladders if a risk assessment shows that a reasonable alternative method can be used. In the window cleaning industry we now have water fed poles which means there is now little requirement to work from ladders.